Sweet Potatoes: Chips, Strips or Fries. Part Two. 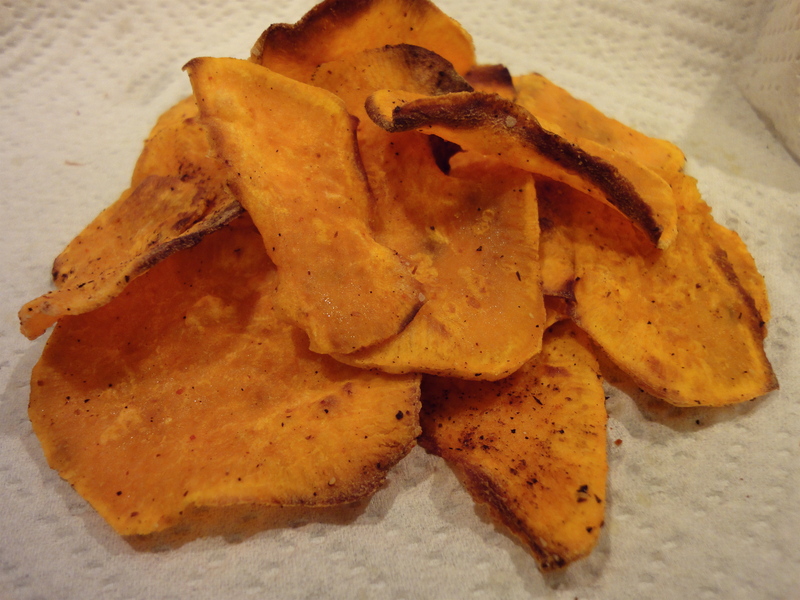 This sweet potato experiment comes from a method of “chips” I stumbled across on foodgawker. SURPRISE! I saw it a few times around the blogging world. It uses one tool: a vegetable peeler. Yep. That’s right. Using your vegetable peeler to make thin strips for sweet potato chips. Good idea in theory. Personally, I found this method more time consuming than trying to slice uniform chips. Also, I thought it was more difficult and my hand got tired. But hey, it was worth a shot. I used the same seasoning as I did for my chips. These took even more babysitting than the chips did. Preheat oven to 425 degrees. Line a baking sheet (or 2 so you can cook both batches at once) with foil and place in the oven while it preheats. Meanwhile, start peeling! Peel off the skin of the sweet potato, discard, then keep on going! It was a little labor intensive for me and it got difficult towards the end. It was also hard to make sure they were all the same size…so they weren’t. Mix together the oil and spices in a bowl. Toss around to coat evenly. When the oven is ready, take the sheet out and place the slices on. A tiny bit of overlapping is ok because the strips are so thin. Bake for about 10-12 minutes. Shuffling them around the pan with a spatula or something so they get crispy. Like I said with the chips, you need to babysit these a little because they go from brown to burnt very quickly! 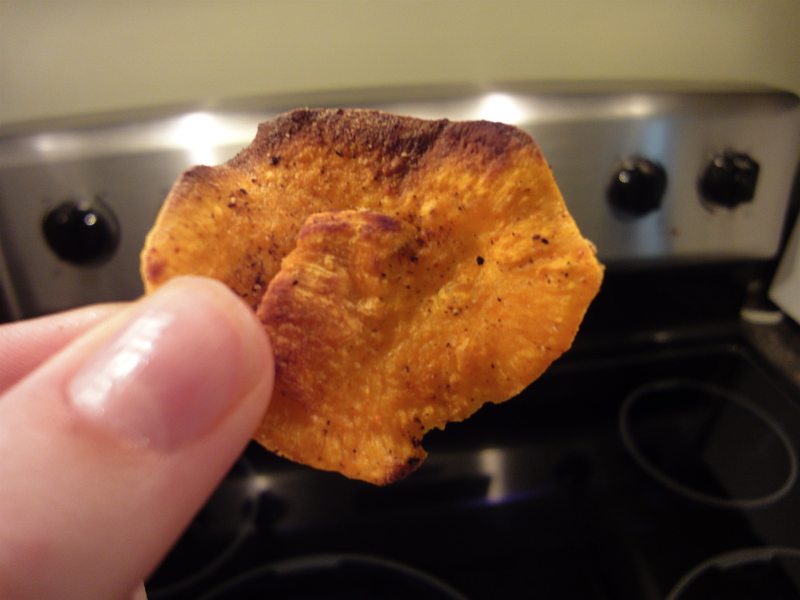 When the chips are brown, take them out and place them on a paper towel to drain. They will crisp up more after they cool. Sweet Potatoes: Chips, Strips or Fries? Part One. The other week I had a craving for sweet potato fries. So I went on a hunt to look for different methods of cooking sweet potatoes in the oven to make them crispy. I found a few that looked interesting: chips, strips and fries. 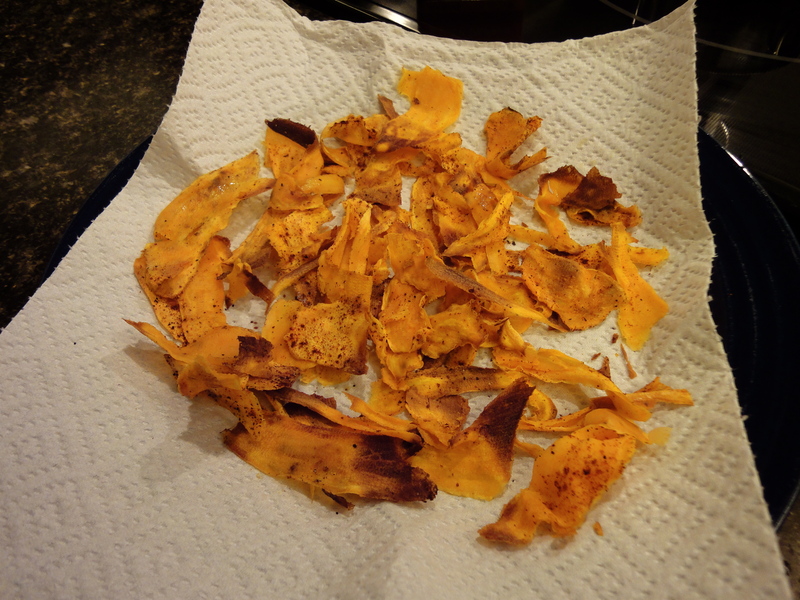 This first experiment was for sweet potato chips. I don’t have a mandolin, but I tried slicing the chips as thin as possible with a very sharp knife, about 1/8” thick. If you have a mandolin I would recommend using it! The chips that were cut the right thickness turned out incredible. Of course, the thicker ones took longer. The thin ones cooked more quickly. You do have to babysit these a little bit after about 5-7 minutes. It’s definitely worth it though. For these experiments, I used one sweet potato for each. Feel free to double, triple, etc. I’m not quite sure how well they keep, but I would think they’d be better fresh out of the oven. Meanwhile, in a mixing bowl, put in sliced sweet potato, oil and spices. Mix well until evenly distributed. Use your hands! It works the best. When the oven is ready, take the sheet out and place the slices on WITHOUT overlapping. At all. Bake for about 10-15 minutes. Turning once when the sweet potatoes start to curl up. Like I said, you need to babysit these a little because they go from brown to burnt very quickly! 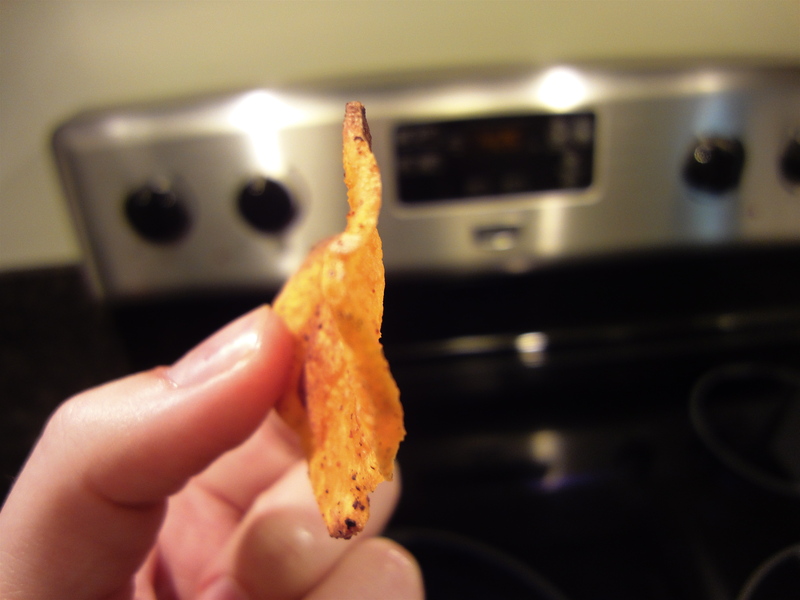 Here’s a good example of a nicely crisped chip and the thickness.